Usually, the Paris Motor Show goes unnoticed by the majority of Americans. But this year, Ford is giving residents of North America reason to pay attention. 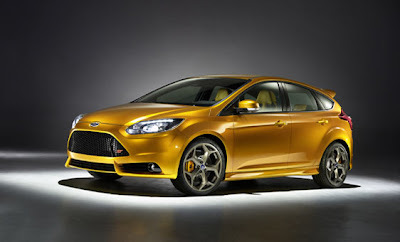 Among other newsworthy items, it will be the venue for the first official viewing of the new high-performance Focus ST. It will also be the first time that a range of production-ready Focus body styles will be displayed together, providing full insight into this significant new model before it goes on sale in Europe and North America early in 2011. The new range-topping Focus – which will feature a unique version of the 2.0-liter Ford EcoBoost™ engine – will be true to heritage of Ford ST models. It will offer driving enthusiasts a mix of exhilarating performance and handling, accompanied by an addictive sound. The dramatic new ST will launch in early 2012 and will be revealed on September 30, 2010, at the Ford stand by Alan Mulally, Ford President and CEO, and Stephen Odell, Ford of Europe Chairman and CEO. Visitors to the Paris Motor Show will immediately notice the car’s highly distinctive sports exterior, which is finished in Tangerine Scream, a dramatic new body color that reflects the exciting and energetic character of the Focus ST.
Ford is also moving forward with its electrification program and will be displaying for the first time the technology destined to drive its C-MAX plug-in hybrid vehicle, that will be produced at the Valencia plant in Spain and is due to go on sale in Europe in 2012. A version will also be sold in North America. The formal launch of the full production-ready Focus range in Paris signals the introduction of the first truly global product developed under the company’s ONE Ford strategy. Developed at Ford’s Global Center of Excellence for Small Cars in Germany, for sale in over 120 markets worldwide, the next-generation model is the most important Focus yet. It is created from the new Ford global C segment platform with up to 80 percent parts-commonality globally. This platform will underpin at least ten vehicles around the world, and it will account for approximately two million units of annual production by 2012.